The brief was to create a stylish Home for a young family, who led incredibly busy lives, where home needed to be an oasis of tranquility as well as being practical for children and for entertaining. The kitchen was revamped, decorated, new handles and appliances, underfloor heating and porcelain tiles brought light and warmth into a dark basement space, as well as using a light colour palette of whites and grey. Bespoke Cabinets for storage and elegance, practical and stylish dining chairs from Marie's Corner with dining table from Poliform and Fosscarini suspended light, new lighting system installed throughout. 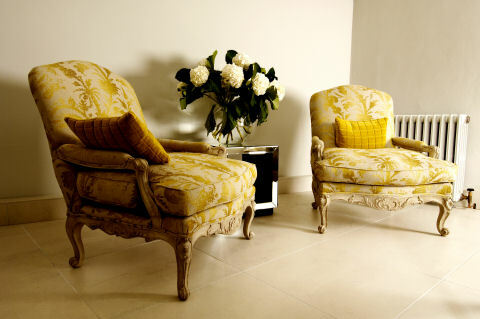 French Louis V armchairs mixing traditional design with contemporary using a Designers Guild fabric. Small Downstairs cloakroom given a fun Tree design wallpaper from Cole & Son, still one of my favourites! Bespoke Console table made to fit around existing radiator, large lamps and lantern introduced to make a narrow hallway have a welcoming effect to the home. The Double reception required to be luxurious as well as practical for young children. 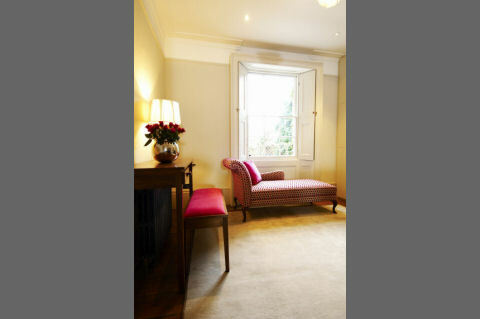 Sumptuous Satin curtains, Velvet covered furniture by Marie's Corner, combined with Porta Romana lights created a sense of glamour, with bespoke floor to ceiling push click cupboards in the back reception room for storage for toys, and a Marie's Corner chaise in Osborn & Little fabric to complete the scheme. The client wanted the masterbedroom to feel glamorous, rich satin curtains, bespoke wardrobes and an Art Deco style dressing table created this ambiance, with bespoke bedside lampshades and bed throws in soft greys and purples in velvet and silks. The heavy sandstone fireplace was removed and a minimal gas fireplace introduced, and a bespoke minimal white cylinder lampshade installed with down-lights positioned infront of wardrobe to create pooled lighting.